Heather is a musician, perfumer, tropical ecologist, and New Yorker who now resides in San Francisco. Her sustainable fragrance line, Carta, debuted during this reflection period. My little brother, Jonathan, has type two spinal muscular atrophy, a savage and rare genetic motor neuron disease characterized by progressive muscle weakness, the symptoms of which begin before age one – meaning Jonathan transitioned from crib to wheelchair. I was nine years old when he was born. My dad took me out for ice cream and explained over a cone of vanilla chip how Jonathan’s body wasn’t making enough proteins to get his legs to work and he wasn’t expected to live past 30 years old. The doctors could be wrong, he said, and anyway, there was no point fixating on a number. I accepted this fact like any kid does when a parent defines something unchanging like Tuesday follows Monday. Nevertheless, there exists a timer buried in my mind whose anxious ticking I’ve strained to ignore ever since. Jonathan turns 30 this July. Thirty years ago, gene therapy was science fiction but my family relentlessly debated its promises as though it was only a matter of time before Jonathan would evolve and rise from his chair like a luckier Frankenstein or an Iron Man. We just had to be patient. But when gene therapy for SMA stalled in the ‘90s, our discourse shifted in turn to finding solutions for improving Jonathan’s comfort rather than for his cure. Then in December 2016, a new drug called Spinraza was brought to market – it was the gene therapy treatment we had always believed would one day come. We were hopeful again despite facing outrageous sticker shock - $750,000 in the first year and $375,000 annually after that, making it one the most expensive drugs in the world. Jonathan set out to best the miles of red tape put in place by his private insurance, North Carolina’s Medicaid board, and Duke University Hospital’s billing department in order to keep someone like him from receiving the drug; Spinraza’s efficacy in adults with advanced SMA is yet experimental and deemed “medically unnecessary.” In the past year, Jonathan has fought to prove that the life a 29 year old is worth the high cost of treatment. I spent most of this Moon List reflection period with my brother. Like the rest of my family, Jonathan veers towards introversion but particularly so within the SMA community. I’ve never asked him why he was so averse to making friends with SMA but I’ve had my suspicions. Maintaining a suspension of disbelief about the reality of 30 would require avoiding any proof to the contrary. But Spinraza’s debut compelled him to reach out to others who were also battling bureaucratic oppression and low expectations. He’s since made some friends. He told me a story – the best one I heard this month - about a woman in California he’s been emailing lately. She also has advanced SMA, is turning 30 years old this year, and began treatment a few months ago. Jonathan told me about a conversation they had where she described a new physical sensation she’s been experiencing lately, one that seemed impossible for him to fathom – leg cramps waking her up in the middle of the night. When my parents retired about 10 years ago, they built a house on the waterfront of the Pamlico Sound, on land that was once a loblolly pine plantation. My dad said it was perfect for him, this vast “OCD” (as he called it) abandoned stand of perfectly spaced trees. The trees, however, made me uneasy. This was around the same time that I had started researching another kind of plantation – oil palm grown in Malaysia. Malaysian rainforests were (and still are) experiencing high rates of deforestation due to the cultivation of oil palm, and my research advisor held a sobering hypothesis – the main family of trees in these rainforests rely on extensive belowground fungal networks to survive, thus an absence of the fungi would indicate a low probability of the trees’ return to abandoned plantation fields. Our data showed declining fungal populations, and I subsequently passed many nights lying awake worrying about the fate of the rainforests. Meanwhile, my dad developed an appreciation for the native tree species persisting on his property – the ancient live oaks growing wild along the shores, protecting the dunes from erosion, and providing shelter for migratory birds. They’re so beautiful, he mused, and their strong roots hold fast when the hurricanes ravage through, unlike the pines that teeter, splinter, and crack onto rooftops. The oaks were ubiquitous until the establishment of the pine plantations; my dad wondered if they would ever return. I told him I would see what the soil had to say about that. North Carolina’s live oaks aren’t so different from the Malaysian rainforest trees – they also utilize fungal networks to establish their seedlings amongst competing tree species. I devised a simple experiment to see how oak seedlings would fare in a battle against pine, and though it wasn’t a perfect or thorough investigation, all signs pointed to the oak’s defeat. Neither my dad nor I were happy about the results. Yet, on a recent walk through my parent’s property, I happened to count more oak seedlings amongst the pine needles than I ever had before. My friend Howard is the type of character who shows up at a bar wearing a tuxedo and promptly announces he has to catch a flight to London in the next hour. I had no idea that Howard can sing, but why not, so I wasn’t too surprised when he invited me to hear him perform at the Golden Gate Men’s Choir’s holiday recital at St. Matthews Lutheran Church. I couldn’t remember the last time I had seen a choir perform. I’ve gone to the opera in the past year and several uninspiring indie shows, but nothing has moved me as much as listening to the exalted sound of a few dozen men harmonizing in unison. Since my band has been on hiatus, my relationship to making music has grown tense and alienating. It’s not so dissimilar from feeling sexual frustration. I needed to be reminded of how the absence of instruments creates space for pure expression and of the powerful simplicity of the human voice... to be reminded that I have a voice, too. I’ve at long last come around to the idea that it isn’t cute to be financially irresponsible, especially approaching 40 years old. I’ve begun to change my ways accordingly and with as much enthusiasm for checkbook balancing as I can muster. I was raised Catholic but have identified as an atheist since I was nine years old; a rigid stance I’ve had to defend time and time again since no one really likes an atheist, especially a fortunate one. This month I launched a business that’s been over a year in the making. It’s an insane and risky venture that makes little sense given my background. People say when you start a company it’s like jumping off a cliff and I can attest to the truth of that. A good friend asked me what gave the moxie to do it and I said, “I don’t know, I just had faith it would work out.” It was like meeting myself for the first time. The path of an artist/maker can feel lonely and isolating at times. I’ve spent an inordinate amount of time alone since last summer often preoccupied with absurd tasks like attempting to reverse engineer spray bottles and agonizing over the ugly shapes of envelopes. There have been countless times when I’ve thought, “I can’t be the first one to have this problem” and then become depressed about not knowing how to find the person with the solution - someone to understand. While researching bottles online I found Megan, a skincare product maker in Indiana who also sources hard-to-find items. We connected over email, at first in politely concise sentences about her bottles but then in longer correspondences detailing our shared hopes and many frustrations. I complained to her about the physical demands of repeatedly fitting plastic plugs into tiny vials. She told me about her bruised fingertips - she had been there too, she said. Brilliant Megan designed a 3D-printed tool specifically for this purpose. She didn’t need it anymore, so she mailed it to me. It worked like a charm. Several years ago, my uncle gifted me the wine carafe that once belonged to my great-grandfather, Dominic. It’s not particularly beautiful but it’s the only item of his that I have so I cherish it. 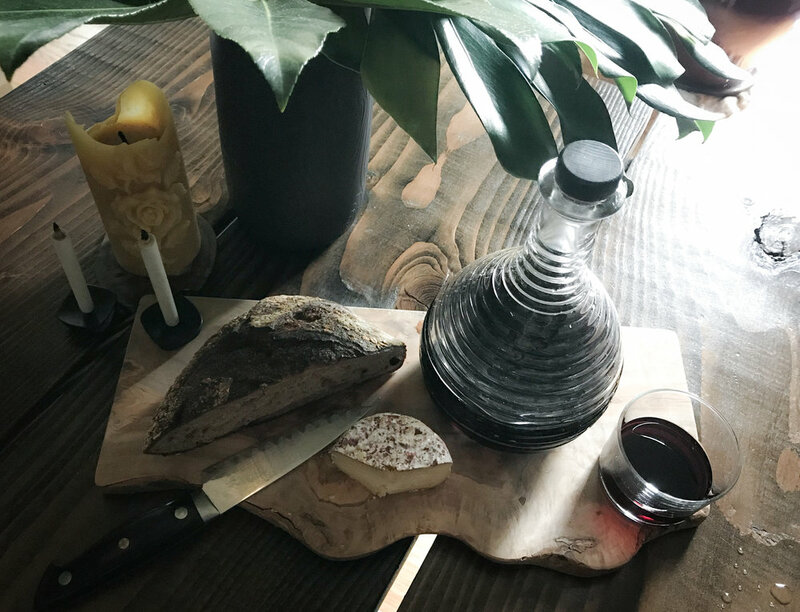 Until recently, I only knew a few things about the carafe and Dominic’s use of it – I knew that he had made copious amounts of wine in the basement of the townhouse shared by my family in Bensonhurst, Brooklyn, I had heard that he brought the carafe over from Sicily and that he kept a juice glass overturned on its neck from which he drank wine out of every night, and I had also heard that Dominic credited his very old age to the daily intake of his home-pressed alcohol. What I didn’t know and had never bothered to ask about was where all the grapes for the wine had come from. It takes a lot of grapes to produce the quantities of wine Dominic was apparently making and I couldn’t imagine there was a bulk grape delivery system in place in 1950’s Bensonhurst. I asked my dad about it during my visit to North Carolina and learned that Dominic had ordered all of his grapes from California, not too far from where I live today. I’m the first of my family to move west and I drink a lot of California red out of Dominic’s carafe. The consistency of that now makes me smile. All of my many houseplants – once a point of pride - are dead or dying because my husband and I recently moved from an apartment with southern-facing windows to western-facing ones. I have come to accept that no amount of watering or fertilizing will save them. 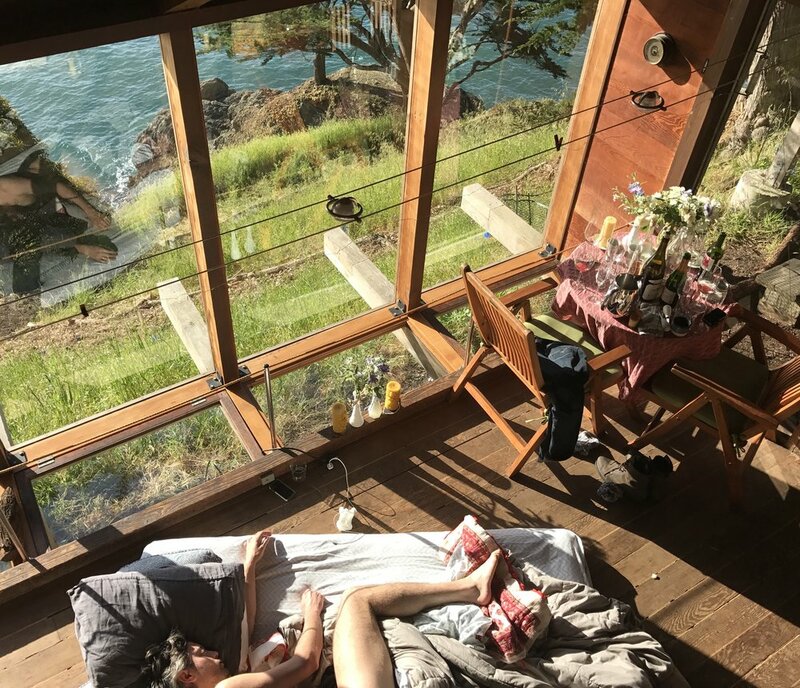 This past May, Dave and I eloped at a little cabin called Spindrift at Muir Beach, which we returned to for the first time after Christmas. We watched the sunset from the same cliff where we had our ceremony months ago and as we stood there together again overlooking the Pacific I was overcome with so much gratitude for my sweet husband, his grounding and supportive spirit that steadfastly carried me through this rollercoaster of a month. Dave and I spent New Year’s Eve with a few very close friends at their house in Glen Ellen. My friend, who is a spiritual coach, arranged for a music therapist to come to the house on New Year’s Day and perform a sound bath for the group, which is a very woo-woo activity, I know, but I have to admit that when the gongs trembled waves of thunderous C notes across my body as I lay supine on the carpet, I felt every cell exhale into oblivion in the most peaceful way imaginable.